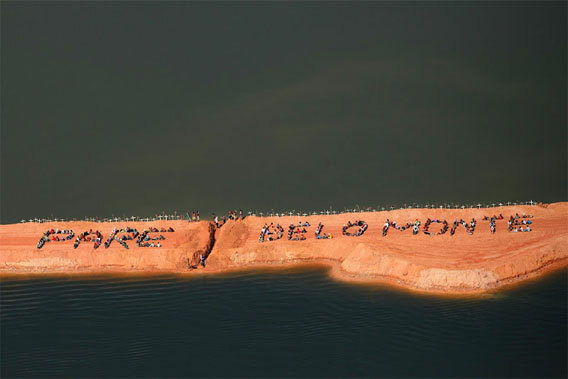 Belo Monte protest. Photo credit: Atossa Soltani/ Amazon Watch / Spectral Q. 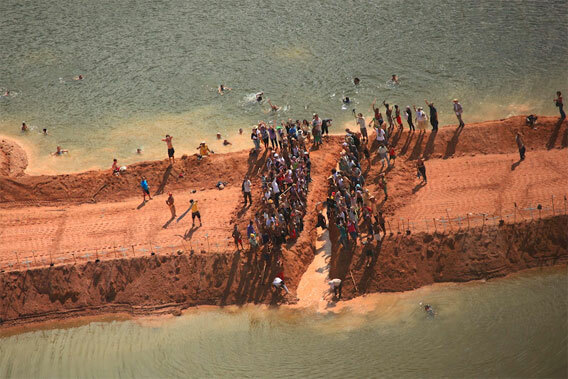 In an symbolic protest of the giant Belo Monte Dam, Friday morning some 300 locals dug a channel in an earthen dam that blocks a portion of the Xingu River and serves as the first step for the controversial hydroelectric project, reports Amazon Watch. "In the early morning hours, three hundred women and children arrived in the hamlet of Belo Monte on the Transamazon Highway, and marched onto a temporary earthen dam recently built to impede the flow of the Xingu River. 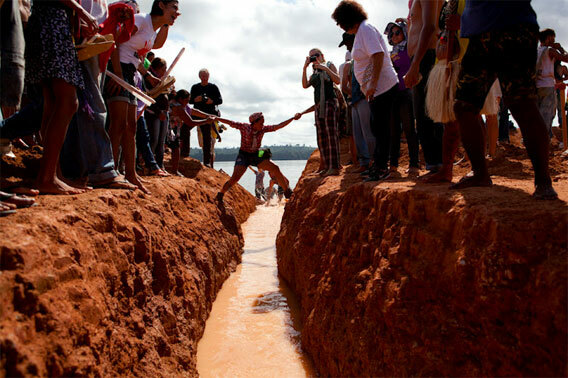 Using pick axes and shovels, local people who are being displaced by the project removed a strip of earthen dam to restore the Xingu's natural flow," stated a press release. The stunt was coordinated to draw attention to the project prior to the opening of the Rio+20 conference to be held next week. Demonstrators have gathered in the town of San Antonio and Altamira, a city that will be partly flooded by the dam, for Xingu+23, a multi-day protect against the dam, which was originally stopped 23 years ago by an uprising by environmentalists and indigenous groups. "This battle is far from being over," said Antonia Melo, the coordinator of Xingu Vivo Movement against the dam. "This is our cry: we want this river to stay alive. This dam will not be built." 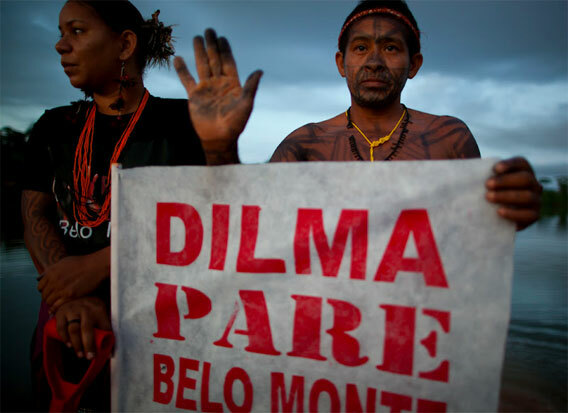 "We, the people who live along the banks of the Xingu, who subsist from the river, who drink from the river, and who are already suffering from of the most irresponsible projects in the history of Brazil are demanding: Stop Belo Monte." 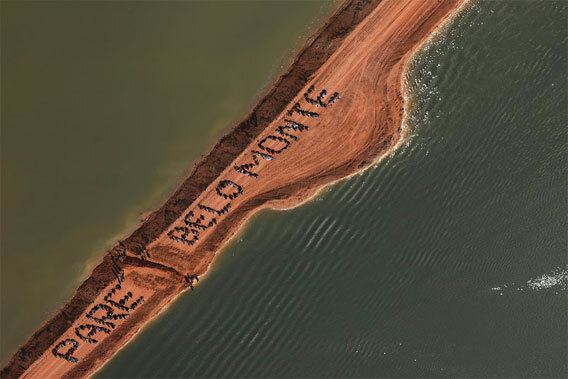 Belo Monte will flood more than 40,000 hectares of rainforest and displace tens of thousands of people. The project will impede the flow of the Xingu, which is one of the Amazon's mightiest tributaries, disrupting fish migrations and potentially affecting nutrient flows in a section of the basin. Environmentalists say the Brazilian government's support of the project is at odds with the green image it projects in international talks and as host of the upcoming United Nations Conference on Sustainable Development. Green groups note that Brazil is planning dozens of dams in the Amazon Basin. In the heart of the Amazon rainforest in Brazil, giant diggers tear into the rock 24 hours a day to extract a dark grey ore rich in the iron on which every modern economy depends. 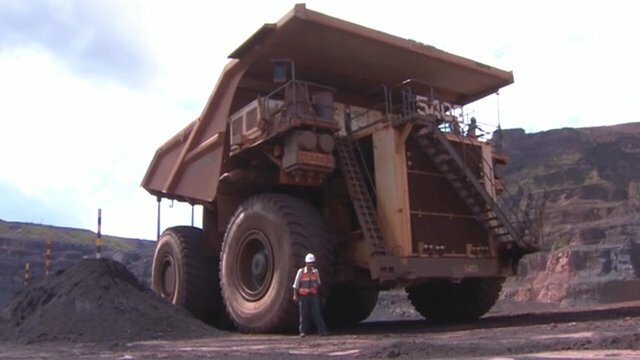 The Carajas complex is the largest iron ore mine on the planet and at any one time 3,000 people are toiling here in the tropical heat using a fleet of giant machines including trucks the size of houses. Amid an ocean of lush green jungle, a series of four manmade chasms stretching deep into the rock represents an ugly first step in the long process involved in making steel. The company operating the mine, the Brazilian giant Vale, often criticised for causing environmental devastation, claims it is planning to restore this landscape to its original state. The conundrum of Carajas is that we all make use of steel but that comes at a price to the natural world. This is the source of a constant struggle between Vale's desire to reach new seams of ore and attempts by the environmental authorities to keep the expansion under control. It is also at the core of the debate on sustainable development at the Rio+20 summit under way this week. I reported on a similar contest in the UK last week, over plans for the expansion of Lydd Airport in Kent close to the wildlife reserve of Romney Marsh. The iron rush here at Carajas was only triggered by a chance discovery. An American geologist, whose helicopter needed refuelling at Carajas in 1967, reputedly bent down to retie a shoelace and noticed the Amazonian soil littered with chunks of rich ore. The lumps he found here, almost as black as coal, are surprisingly heavy - I picked one up - because this ore has one of the highest iron contents anywhere in the world. Nearly half a century later, the mine processes a staggering 300,000 tonnes every day and last year generated an immense total of 109 million tonnes - snapped up by the fast-industrialising economies of Asia. At first sight the mining operation appears breathtakingly destructive. For a start the mine is smack in the middle of a National Forest and what was once a landscape of dense vegetation is a now a moonscape of bare cliffs and billowing dust. The whoops and cries of jungle birdsong are replaced by the constant roar and grind of hundreds of massive engines. But Vale, like most multinationals these days, is eager to promote the idea that sustainability is embedded in its thinking and points to a series of measures designed to limit the mine's impact. The operations manager of the mine, Jaymilson Magalhaes, tells me that the mine complex only covers about 3% of the area of the national forest and that before any digging can start, the company has to have a restoration plan to return the area to its original state. That includes using spoil to fill in the mines once they are exhausted to reshape the topography - a process we witnessed in one small area - and undertake a massive replanting programme using native species. "I believe we genuinely can restore the forest and we have a strategy to do that," Jaymilson tells me. "What we do is very careful planning so that when we finish we know exactly the plants we need to replant and we have nurseries with the original vegetation. "When we grow them we will reposition the soil so the forest can grow back to its original state." Vale also highlights its support for an extensive monitoring operation in the forest run by the Brazilian Government's conservation agency ICMBio - so we checked with the agency to get their perspective. Frederico Drumond Martins of ICMBio is the manager of the national forest and agrees that Vale is trying to be greener - for example, he says, he only has 12 rangers but Vale pays for a further 80, plus cars, boats and the use of a helicopter, all vital to guard against illegal logging and poaching. "Vale is really trying to operate sustainably but there's a long way to go - for Vale the iron comes first and Nature second or third." Frederico and his colleagues are locked in a series of disputes with Vale over its plans for new mines in the forest. "My job," he tells me, "is not to stop the mining - it is good for the economy and it puts Brazil in a good position in the world - but it is to control it." 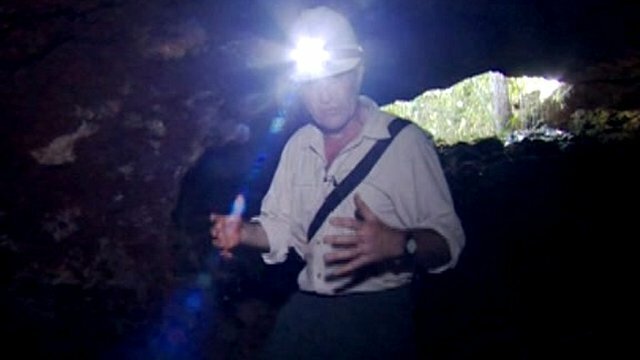 One of his greatest concerns is to preserve a surprising and recently discovered world beneath the Amazon - a series of caves lurking in the iron ore under the forest floor. In this one region, some 2,000 caverns have been found and scientists regard them as potentially precious features because of their iron content, unusual biology and archaeological remains. A cave we descended into hosts four species of bat - only one of them carnivorous, luckily - and excavations in its floor have revealed evidence of human habitation as long as 9,000 years ago. The air inside was cool and musty and there was a constant squeaking from the bats as they fluttered above our heads. ICMBio and Vale are surveying the caves to rank their importance - only those granted the highest grade will be saved from mining while some may be destroyed if others are preserved. The status of the cave we visited has yet to be decided so its fate is unclear. It lies within a zone identified for potential mining by Vale but any bid to start digging will require a lengthy planning battle. The rainforest is under assault from a variety of sources and, compared to soya planting and cattle grazing, iron ore mining causes relatively minor damage. And there's an irony: the vehicles used by the conservation rangers around are made with steel that may have had its origins in this very landscape. Expansion of the mines would create new jobs and lead to valuable exports. An informal estimate of one planned project is that the ore could yield, at current prices, a staggering $800bn. Set against that is a growing awareness of the uniqueness of the forest, not only with the ecosystems thriving within and below its canopy, but also a dark and largely unknown realm under the forest floor. As Frederico of ICMBio puts it: "The iron is for this generation but the forest is for the next generation." As the host of the Rio+20 summit this week, Brazil faces its own difficult choices over how to define the much-disputed phrase 'sustainable development' and what it means for the jungles and caves of the Amazon. Early inhabitants of the Amazon River Basin had little long-term impact on the forests in the area, overturning the notion that the region was a cultural parkland during pre-Columbian times, claims a new study published in the June 15 edition of the journal Science. 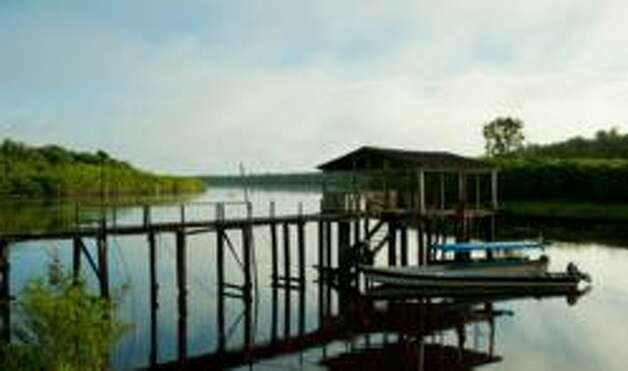 The discovery comes after a team of researchers hailing from the Florida Institute of Technology (FIT), the Smithsonian Institution, Wake Forest University and the University of Florida (UF) conducted the first landscape-scale sampling of central and western Amazonia, according to a Thursday FIT press release. They discovered that the earliest inhabitants spent most of their time near lakes and rivers, and had such little affect on the areas further inland that it seemed as if they could have been tip-toeing from one body of water to another, they added. “The research team, led by Florida Tech’s Crystal McMichael and Mark Bush, retrieved 247 soil cores from 55 locations throughout the central and western Amazon, sampling sites that were likely disturbed by humans, like river banks and areas known from archeological evidence to have been occupied by people,” the university explained. Their findings are important, as they shed new light on how the Amazonia — one of the world’s most biologically diverse areas — was impacted by humans during its earliest days. That knowledge can help experts learn more about the ecological processes of tropical rainforests, and could aid ongoing conservation efforts, according to FIT. “Drawing on questionable assumptions, some scholars argue that modern Amazonian biodiversity is more a result of widespread, intensive prehistoric human occupation of the forests than of natural evolutionary and ecological processes,” Dolores R. Piperno, co-author of the study as well as a senior scientist at the Smithsonian Tropical Research Institute, said in a separate statement. “Climatologists who accept the manufactured landscapes idea may incorporate wholesale prehistoric Amazonian deforestation, widespread fires and carbon emissions into their models of what caused past shifts in atmospheric carbon dioxide and methane levels. But we need much more evidence from Amazonia before anything like that can be assumed,” she added. Cocoa remedy for Amazon deforestation? A chocolate factory nestled deep in the Amazonian jungle in Brazil's northern state of Para offers a sweet antidote to rainforest deforestation. In many areas of the Amazon, cocoa and other crop production have historically contributed to deforestation as farmers wear out the soil and cut further into virgin forest to obtain fresh land for cultivation. But cooperatives like the one at Medicilandia on the Trans-Amazonian highway aim to preserve biodiversity by replanting on deforested areas in the shade of the canopy, returning cocoa production to its sustainable roots. "For decades, the Trans-Amazonian has been synonymous with crimes against the environment. We gave an image of Amazon destruction that we now want to change with this initiative," said cooperative president Ademir Venturim. The bright-yellow "Cacauway" chocolate factory in Medicilandia takes cocoa from 40 small-time producers in the area. "For us, the factory is an experiment which can be replicated throughout the Amazon region, by promoting Amazon products," Venturim told AFP. "By creating jobs and revenue, we are fostering the economic, social and environmental development sought by Rio+20," he said, referring to the June 20-22 UN summit on sustainable development in Rio de Janeiro. Deforestation will feature strongly at the Rio gathering, which aims to steer the planet toward a greener economy that recognizes the need to protect and restore vital natural resources such as the Amazon rainforest. Deforestation -- caused by logging, agriculture and development -- in the tropics accounts for up to 20 percent of global emissions of carbon dioxide, making it the second largest driver of global warming after the burning of fossil fuels. Amazonia, which environmentalists describe as the "Lungs of our planet" because it produces roughly 20 percent of the Earth's oxygen through photosynthesis, accounts for nearly half of those emissions. Experts are especially alarmed because the impact cuts both ways: climate change threatens to boost the rate at which the Amazon's delicately balanced rain forest dries up, and could push it to a tipping point beyond which recovery would become difficult or impossible. The UN's Intergovernmental Panel for Climate Change (IPCC) has warned that rising global temperatures could transform much of South America's rain forests into semi-arid savannah-like areas within five decades. Located in the southwest of Para, one of the Brazilian states hardest hit by deforestation from agriculture and logging interests, the "Cacauway" chocolate plant began small by marketing its products in local shops. "We have exceeded our expectations," Venturim said. Cocoa bags carry the name of the individual producer, such as Enivaldo Andrade Pereira. The "plant is one of the best things that happened to the region," Pereira said, stressing that the prices now paid to cocoa producers here are 50 percent higher than those offered by the country's big chocolate makers. Pereira's father arrived in the region in the 1970's when the then military regime encouraged farmers to settle the Amazon. Like many others, he cleared the jungle to make way for grazing land and to plant sugar cane. Later he switched to cocoa. The area, surrounded by deforested pasture, has been replanted with 12,000 cocoa saplings interspersed with 400 mahogany saplings and other Amazonian tree species. "Cocoa needs shade and today we are suggesting alternating its production with that of other Amazonian native trees such as mahogany, the Brazil nut or Ipe trees," said Joao Batista, who works for an NGO promoting family farming. Organic cocoa is also making inroads here as it fetches much higher prices and can be sold on the lucrative international market for high-grade chocolate. Darcirio Vronski, a pioneer in a cooperative of 23 families who make organic cocoa sold to the Austrian chocolatier Zotter, told AFP that when he switched from sugar cane to cocoa he was harshly criticized by his peers. "But those who stuck with sugar cane degraded the land while ours remained incredibly fertile," Vronski said proudly. Para state is one of the major producers of cocoa, a home-grown Amazonian product that is increasingly being seen as a great opportunity for the crucial region's regeneration. "Before cocoa, farmers were destroying the forest by planting, now degraded areas are regenerated by planting Amazonian products that bring revenue for the producer," said Sebastiao Augusto, a professor at the Federal University of Para. Large-scale deforestation has made Brazil one of the world's top greenhouse gas emitters, but the government has vowed to curb it and has made significant strides in the past decade. This week, Brazilian authorities confirmed that deforestation fell to a record low of 6,418 square kilometers (2,478 square miles) last year, down from a peak of 27,000 square kilometers (10,000 square miles) in 2004. Manoel Jose Leite, a small-scale organic farmer, is set to pioneer low-carbon agriculture in Brazil's Amazon rainforest, which for decades has been destroyed by expanding agribusiness. Finding the right balance between agriculture and environmental protection will be one of the major challenges on the agenda of the UN conference on sustainable development, which opens in Rio on Wednesday. The issue is particularly pressing for leading grain exporter Brazil, 40 percent of whose huge territory is covered by the Amazon rainforest. "We have learned a lot from the environment. We have some ideas of what reducing CO2 emissions means and we know that we must protect the Amazon," says Leite, who tills land in Brazil's northern Para state. He arrived in this northern Brazilian city in 1974 when the then-military government encouraged people to settle the region by opening highways such as the Trans-Amazonian, which cuts through Anapu. "There was only forest. The government wanted to settle the area. The more we cut trees, the better. If I had known then what I know now, it would have been different. I would have protected the forest," the 62-year-old told AFP as he stood by a spring on his land, which once was used for grazing. Today he protects the environment with native tree reforesting, including planting Amazon rainforest trees such as cocoa, cupuacu and acai. Leite is about to join a new project financed by Brazil and Norway that will help 2,600 families rehabilitate deforested areas with low-carbon farming, energy production and efficient use of resources. "We want to show that you can have low carbon farming that reconciles forest preservation, food production and quality of life in the Amazon, where 25 million people live," said Lucimar Souza, of the non-governmental Amazon Environmental Research Institute (IPAM). Similar projects are proliferating in the region. "Between the 1992 Earth summit and the Rio+20, we went from unplanned production based on destruction of the forest to an awareness that this model is not sustainable," said Joao Batista, coordinator of the Live, Produce, Preserve Foundation. Asked what was needed to make this remote region sustainable, Batista replied with a sigh: "a lot", underscoring the need for programs, technology and funding. The reconversion coincides with a government commitment to combat the massive deforestation that has made Brazil one of the world's top greenhouse gas emitters. The pace of deforestation peaked in 2004 at 27,000 square kilometers (10,000 square miles) a year. But last December, the National Institute of Space Research (INPE) said deforestation had dropped to 6,238 square kilometers (2,408 square miles) per year, the lowest level since monitoring began in 1988. The Brazilian Institute of Environment and Renewable Natural Resources (IBAMA) has taken action to crack down on 50 deforested zones spotted by satellites and to determine whether timber used in Anapu sawmills is legal. Such action marks a drastic improvement from 2005, when local big landowners ordered the killing of US missionary Dorothy Stang, who was campaigning for sustainable forest projects in the face of large-scale illegal logging. "With these sporadic actions we have significantly slowed down the deforestation" in recent years, said Eduardo Lameira, the head of a task force equipped with a helicopter and 4x4 vehicles to raid remote areas. But challenges remain, and Brazil's dilemma was illustrated by the recent implementation of a new forest code, passed after a bruising congressional battle between the powerful agribusiness lobby and environmentalists. The new code maintains a requirement to protect 80 percent of the forest in rural areas of the Amazon and 35 percent of the Sertao, the arid hinterland of northeastern Brazil. But it eases restrictions for small landowners who face difficulties in recovering illegally cleared land. In 1974, Brazil produced 20 million tons of grain, cereals and oilseeds. Today, it produces 160 million and has become a leading exporter of sugar cane, meat, soybean and timber at the cost of large-scale Amazon deforestation. "Today we know that we cannot produce the way we did 40 years ago. We have enough deforested areas and the technology to use them for more efficient farming which preserves the environment," said Savio Mendoca, an adviser at the Brazilian Agricultural Research Corporation. The issue will hotly debated at the Rio+20 conference, which will be attended by more 115 world leaders June 20-22, with the aim of charting a course toward a "green" economy that can balance economic growth with poverty eradication and environmental protection. The Nature Conservancy announced today that Macy’s “Give, Get, and Save the Rainforest” shopping pass promotion has helped raise more than $3 million for conservation efforts in the largest remaining tropical forest on our planet. Macy’s “Give, Get and Save the Rainforest” program launched on May 13 and was part of the retailer’s Brasil: A Magical Journey campaign. “We are thrilled with the results of this campaign,” said Dr. M Sanjayan, lead scientist for The Nature Conservancy and CBS Network News, Science and Environment Contributor. “Our on-the-ground efforts in the Amazon Rainforest are benefiting greatly from this partnership, and through this promotion, we are substantially raising awareness and support for the environment and our planet." Macy’s Brasil: A Magical Journey tribute launched this spring with the aim of capturing the spirit of this rich and intriguing culture through specially curated in-store shops, collaborations with well-known Brazilian fashion designers, Brazil-themed events in stores and the fundraising program to benefit The Nature Conservancy’s efforts to protect the Amazon Rainforest. The $3 million was raised through the sales of a $3 shopping pass from May 13-31 in Macy’s stores across the country. Macy’s contributed 100 percent of every $3 to the Conservancy. In addition, 10 percent of the sale price of every product sold through July 15 within Macy’s “O Mercado”—a specially-curated shop featuring merchandise from Brazil and inspired by Brazil in approximately 300 Macy’s stores nationwide and on macys.com—will also benefit The Nature Conservancy’s work in the Brazilian Amazon. “We are thrilled with this enthusiastic response from our stores and our customers and are excited to make such a significant contribution to The Nature Conservancy’s important work in the Brazilian Amazon Rainforest,” said Martine Reardon, chief marketing officer for Macy’s. The Nature Conservancy is a leading conservation organization working around the world to protect ecologically important lands and waters for nature and people. The Conservancy and its more than 1 million members have protected nearly 120 million acres worldwide. Visit The Nature Conservancy on the Web at http://www.nature.org. From fashion to entertainment, take a journey with Macy’s this spring and uncover the magic of Brazil! For more information about Macy’s Brasil tribute, including hi-res images, please visit magicbulletmedia.com/MNR/MacysBrasil/. Macy’s customers can visit macys.com/brasil to shop for the latest Brazilian fashions and locate exciting in-store events. At a northern point of South America’s vast Amazon rainforest, where the lush jungle landscape meets the sparse savanna region, researchers have found evidence of a unique farming technique employed by the indigenous peoples centuries ago. Long before the arrival of the Europeans to the continent, bringing with them their destructive slash and burn methods of clearing fields, ancient peoples utilized what is now commonly referred to as raised-field farming. For raised-field farming to work, small mounds of dirt would be erected along the outside edge of the forest in order to best form a border between forest and clearer land. These mounds would serve a dual purpose, providing both an elevated farming area and a type of protection for areas typically known for their floods and droughts. While the mounds of earth were feats of engineering prowess in themselves, they provided the land and the people that utilized it with a higher quality of harvest and soil. Set high above the jungle floor, the mounds were perfect for capturing rain and draining it easily to the ground below – keeping the soil in the mounds moist and constantly aerated. Now compare this with the more invasive slash and burn agriculture and it becomes a wonder why the more eco-friendly method ever disappeared. While the burning method proves exceptionally successful in clearing large areas of land in order to make way for new crops and harvests, it does little for the land that it touches. After being set aflame, the land loses valuable minerals and nutrients, causing much more than superficial damage and effectively ruining the internal foundation of the land. What this means for the Amazon now could be a breakthrough in conserving this precious resource. Covering approximately 2.5 million square miles of landscape, the Amazon contains more than half of what is left of the planet’s rainforests. The densely forested land is home to about one-tenth of the world’s known species, and sits atop almost 100 billion tons of the world’s stored carbon. Eliminating this forest (or parts of it) would be eliminating the buffer that keeps that carbon load suppressed. If the carbon were to be released than the damaging effects of global would speed up rapidly: putting the planet at higher risk. Amazon Rainforest News © Copyright 2010. All Rights Reserved.